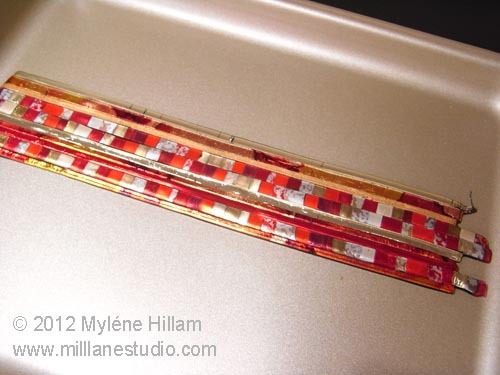 Mill Lane Studio: Work or Play? Friendly Plastic is Fun Either Way! I can't work out whether I'm working or playing today. You see, I'm doing something that I love to do - playing with Friendly Plastic! And even though I'm working on a commission for a customer, it's hard to call it work when you love working with a medium so much..... it's much more like play! ....... a Fracture and Fusion cuff bracelet à la Jana Ewy. Jana is truly the queen of this technique! Check out her Just Bananas gallery for lots of fantastic and inspiring eye candy featuring this technique. 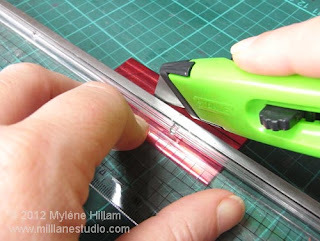 I started by pre-scoring my strips of Friendly Plastic using a Stanley Knife and a metal edged ruler with a grid on it. 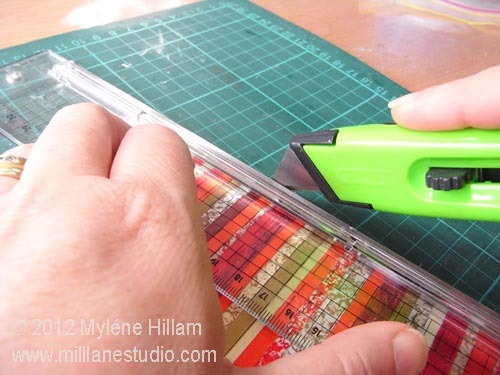 The grid makes it easy to cut the strips accurately. It also has a guard so that your fingers won't get cut if the knife slips - a very important point when you're cutting something as slick and slippery as Friendly Plastic. Once the pieces are scored, if you haven't cut all the way through with the knife it's easy to cut through them with scissors. 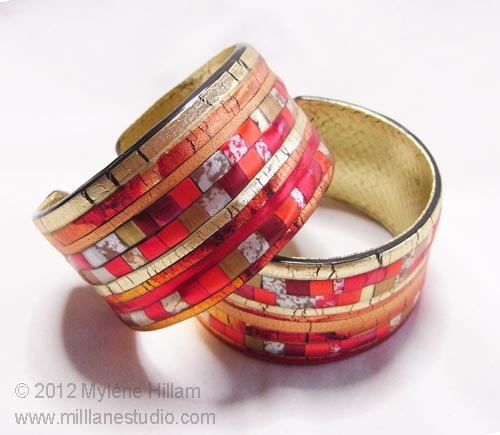 This bracelet is in shades of red but I'll also add some silver and gold to brighten it up. I just love a touch of metal! Before committing anything to heat, I layout all the pieces to make sure I'm happy with the colour combination. Then I turn on the griddle and begin to fuse the base pattern, one strip at a time. It takes a bit of time and you need to watch the temperature of the griddle...... hot spots form where the element lies and cause air pockets to form underneath the Friendly Plastic. 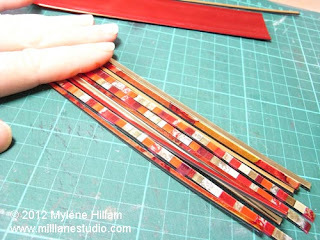 You can see where they've formed in my finished strip but you can flatten them back down by lightly sliding your finger backwards and forwards over them. Taking the tray off the heat to do this seems to be more effective than if you leave it on the heat. 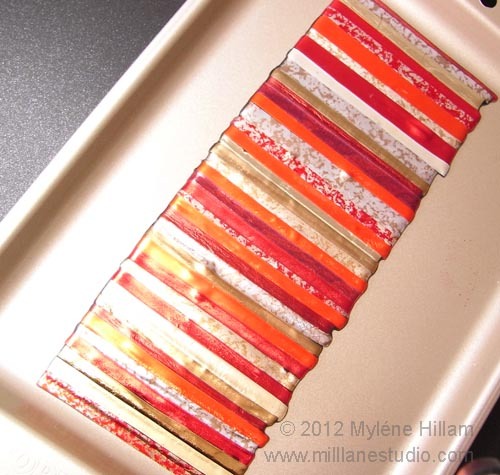 Once all the strips have melted together, plunge the tray into cold water for a few minutes to cool and harden. Now it's time to fracture the strip. 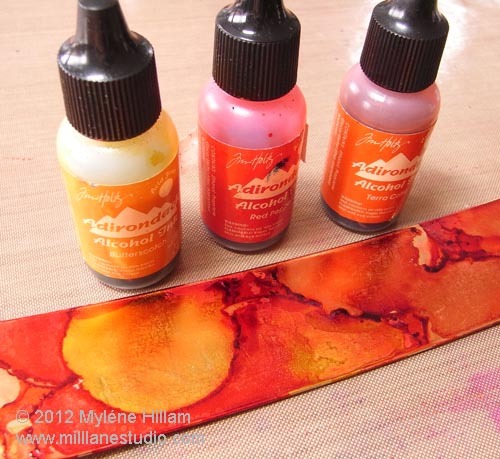 I decided to add more variety to the design by adding a strip coloured with alcohol inks. I chose a gold strip as the base so that it has a metallic look about it. Wow!! Don't those colours just pop? Once the alcohol ink had dried, I cut this into strips too. 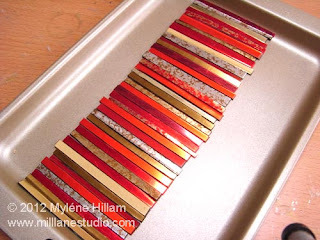 I also added gold and red strips for some solid colour. which I forgot to photograph! Sorry! 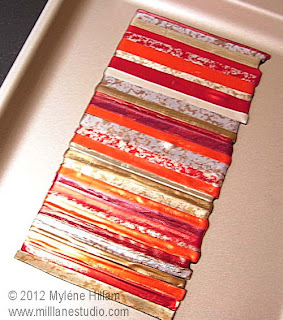 But here's how you turn the fused strip into a bracelet. Firstly, trim the strip so that it's the same length as a regular strip. Next, heat a 7" strip of Friendly Plastic (coloured side down) on a flexible silicone sheet until it had completely softened. This will be the inside of the cuff. You need a steady hand for the next step so you have to take your time. Line up the fused piece with one end of the gold strip and gently lay it down on top making sure to exclude any air pockets. After 3 or 4 minutes the two pieces will be fused together and ready to be wrapped around a jar to create the bracelet shape. To cool the Friendly Plastic quickly, plunge it (jar and all) into cold water to harden. 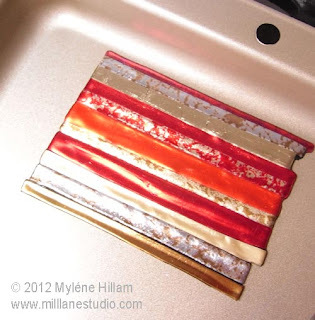 Once it has cooled, it will come away easily from the jar and the silicone sheet. 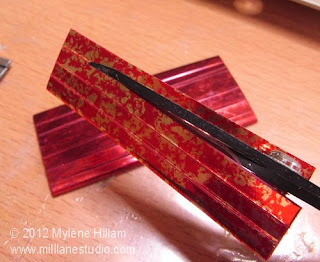 Round the corners with scissors and the bracelet is ready for a coat of resin to make it more durable. 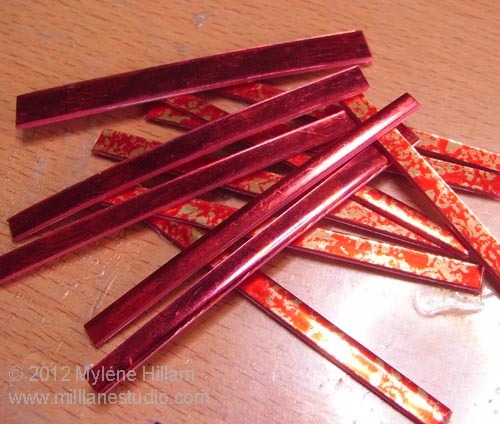 The resin will also brings out the wonderful metallic colours making the Friendly Plastic look more like dichroic glass. Just stunning! So what's the verdict? Was it work or play? Definitely play - Friendly Plastic is just so much fun!